In case you don’t know the, The Mariana Trench is the deepest part of the world’s oceans. It’s located in the western Pacific Ocean, an average of 200 kilometres (124 mi) to the east of the Mariana Islands, in the Western Pacific East of Philippines. It’s about 2,550 km (1,580 mi) long and 69 km (43 mi) wide on average. It reaches a maximum-known depth of 10,994 metres (36,070 ft) at a small slot-shaped valley in its floor known as the Challenger Deep. For comparison: if Mount Everest were dropped into the trench at this point, its peak would still be over 1.6 kilometres (1 mi) underwater. In 2009, Mariana Trench was established as a United States National Monument. A few years ago I bought the book What If? 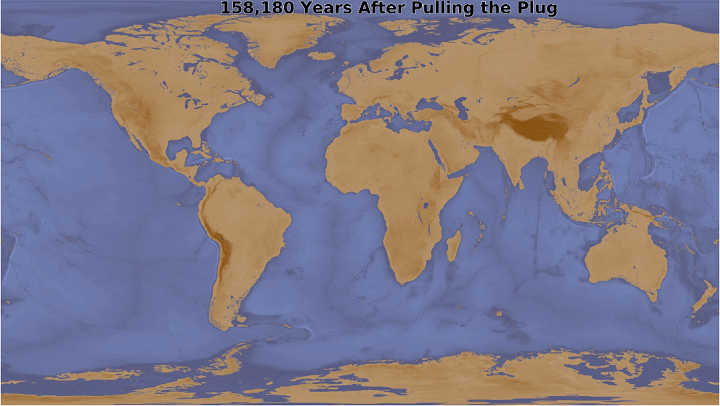 by Randall Munroe of XKCD fame, which included a map showing what would be left of the world’s oceans if you pulled a 10m plug in the Marianas Trench. He did a post about it online here as well. I decided to build a model (likely similar to what he built, given the similarity of the final result) that would allow me to animate it. I used the ETOPO1 Global Relief Model, which has a pixel size of about 1.8km across. It’s the equivalent of a 233MP photograph in size and includes of the earth’s elevation and bathymetry (i.e. ocean elevation). I also used the Natural Earth Oceans and Lakes + Reservoirs data sets from here. Much of this data was combined or converted between vector and raster using various GDAL tools, whose scripts you can see here. Most of the processing was done using GeoTrellis in Scala. Full source is here. The key was a scanline flood fill algorithm (a fancy term for the paint bucket tool you might have used in MS Paint) that was adapted from Lode Vandevenne‘s work, which was modified to support wrapping at the edges so that it could be used on a globe. It’s here in the source. The math for calculating the time is based on a simplified version of the Bernoulli incompressible flow equation. Basically, the volume of the water that drained divided by the flow rate calculated from this equation. It can be seen here. It slows down near the end because each frame represents a 10m drop in the ocean, which takes less time as the volume of accessible water decreases.